Even now, over 50 years after it saw active service, the Tiger tanks still exert a powerful pull over military modellers and historians. Although relatively few were produced, they had a dramatic effect both strategically and psychologically in any area they served. With many excellent kits now available, good references are more important than ever. Thomas Jentz has a well-deserved reputation for the quality of his research and writing. These books can only enhance his reputation. These titles follows his standard approach of using only original material for his research. He is also meticulous in using correct terminology. Many "myths and legends" have sprung up from poor research being printed. These books should assist in clearing up some of these. These books are the first two volumes in a three book series on the German Tiger tanks. Perversely, they are volumes 2 and 3! The first volume on the Tiger I is not yet available. The first chapter "sets the scene" prior to explaining the use of the Tiger. It is broken up into sections on firepower, mobility and survivability on the battlefield. The firepower section contains drawings of the various types of rounds used by the 88mm Kw.K.36 and Kw.K.43 main guns. In addition, it provides penetration data for the rounds. The sights used are also described, as is the drill for engaging targets. A Tiger I could open fire for effect at ranges up to 1200 metres while a Tiger II could engage up to 2000 metres. A stationary tank could be engaged at up to 4000 metres! The paragraphs on mobility include information on speed, range and turning circles. There is also a very interesting table of operational availability for each tank type. Throughout 1944, the Tiger compared very favourably with the Panzer IV. Survivability on the Battlefield fully covers the ability of the Tiger to withstand enemy fire. Very full details are included on shoots carried out by the British during 1943 and 1945. These tests demontsrates two facts - the Tiger was a real problem in 1943, and AP rounds had improved considerably by 1945 - if it hit at the right angle, a 17 pounder round could defeat the armour on the turret at over 1000 yards range. Although not specifically related to modelling, this section is extremely interesting. There are also some very interesting photos of the damage to SS Pz Abt 101 tiger # 334 from the 1945 British tests. The next chapter starts to explain the organisation of the Tiger units, and the deployment of the tank. The creation of the units is fully covered and the composition of the units is shown in chart form. This chapter covers the 1943-1945 period and lists all Tigers allocated to units through out this period. The following section explains the tactics and formations used by the Tiger units. This section is absolutely fascinating because from this it becomes clear why the Tiger was such a problem. If it was used correctly the Tiger was a very potent weapon. The final chapter, which is actually the majority of the book, covers the operational history of the Tiger, from the first actions around Leningrad in 1942 to the end in May 1945. A great deal of the information in this section is made up of combat reports written by the units, and comments from higher ranking officers. All theatres of war are covered in great detail, and there is a good selection of photographs for each area. It makes absolutely fascinating reading and the problems the German forces had as the war progressed become very clear. Throughout this section are many tables which show the strength of the units, write-offs and new allocations. The final section in this chapter is a section on the opinion of US tank crews on the Tiger, or perhaps it would be better to say, their displeasure at the inferiority of their own tanks. A translated Russian document is the final item, it reads more like a propaganda leaflet than anything else, although it gives an interesting view on German tactics. The appendices cover the allocation of all Tiger 1 and 2 tanks and finally a glossary of German military terms. In summary, I have found this to be an absolutely enthralling book - it has a large number of photographs, so it has modeller appeal, but the real value is in the text. 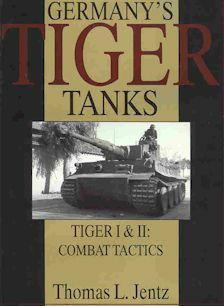 If you want to understand the deployment of the Tiger tank it is an essential book. 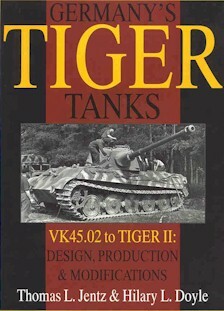 The second volume to be released is subtitled "VK 45.02 to Tiger II" It covers, in great detail, the lead up to the production of the Tiger II and the actual production of this AFV. All modifications and design changes are explained in both tabular and text form. Chapter 4: Panzerkampfwagen "Tiger" P2 - chassis development, turret development and production contracts. Chapter 6: Panzerkampfwagen Tiger Ausf B - description, Tiger 2 production, modifications during production, modifications after issue and modifications after development. Chapter 4 follows the evolution of the proposals to mount an 88mm main gun into a tank. Interestingly, Hitler had demanded the development of a tank fitted with an "88" even prior to Barbarossa beginning. The introduction of a new tank caused a lot of problems as nothing "off the shelf" could be used as the tank was also to have sloped armour. There is a comment included from one of the German engineers (Oberbaurat Rau) that they already understood the benefits of sloped armour and did not need lessons from the Russians - but the Russians do seem to have given them a new focus! From reading this section, it becomes clear that there were problems with the P2 and in the end it did not enter large scale production. The next chapter covers the evolution of the Henschel unit, which became the Tiger II. Although development of this unit started in April of 1942, problems with design work meant that the Tiger I was produced for far longer than was originally intended. The evolution of the design is fully detailed and there are a number of drawings of the chassis and turret - some German sketches and a number of superb drawings by Hilary Louis Doyle. Chapter 6 fully describes the Panzerkampfwagen Tiger Ausf B (as it was now designated) All sub - assemblies used in the Tiger B are fully described - both "cosmetic" and mechanical. There are, once again more of the superb drawings by Mr Doyle. These cover variants produced in Nov. 1943, Jan. 1944, June 1944, June 1944 with Serien - Turm, June - July 1944 Panzerbefehlswagon, Sept 1944, March 1945 and finally July 1945 (never delivered!) In all cases, the drawings list the changes that had occurred. The coverage of the inside and outside of the Tiger B is exhaustive and the many detail items that are important to modellers are fully described including features such as tracks, hatches, turret. The majority of surviving Tiger B tanks have been photographed to show all the details that are not visible from period photos. In all cases, the photos of the preserved units are all marked "ignore the colour scheme" - a very sensible precaution. The final section is a very full Appendices section covering "P2" proposal, Porsche design data, Tiger II data, Tiger B technical specifications, Part numbers for turrets(!) and finally armour specifications - including comments on testing.